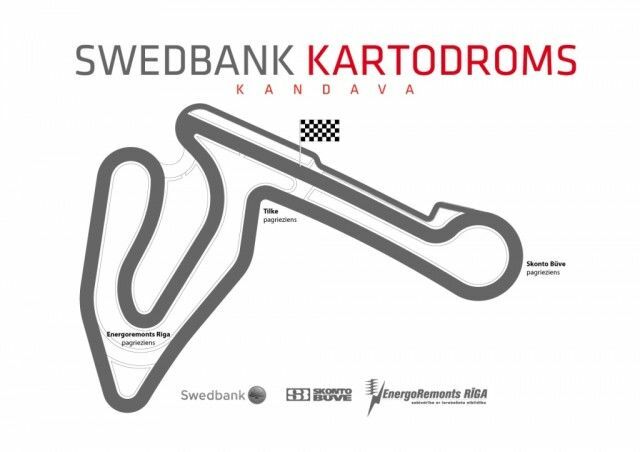 The fourth, 2016 season’s stage definitely promises to be very special, because after almost two-year break, this saturday - 07.02., will meet on the race track in Kandava. Already we know that from the beginning of the season was not really clear opportunity to organize one of the stages in Kandava, but with the arrival of the summer came great news on the race track in Kandava and this season will be even entire two. Saturday at Kandava hitting third Pro-Kart stage, as well as flat, parallel with the ever going LMT AA Karting Cup third stage. Also during this week, till 29.06. 00:00 pm is proceeding actively registration of participants, this can be done www.prokart.lv website , in the section " Race ". At present, the competition has already signed up 137 racers from 5 countries. As well as, of course, the fact remains that all competition-related provisions can be found in the "Terms". Here is a little insight about Kandava’s Kartadroma history - it was built in 1972. In 1987 it was renewed asphalt cover. In 2008, the track has been completely renovated, transformed its configuration and built according to international standards. Reconstruction designed by Hermann Tilke and his office Tilke GmbH, which has developed a number of Formula 1 track projects. We invite athletes to carefully examine the statutes and the agenda, given the large number of participants please not to interfere, to be the organization and themselves to keep up with their start times. Free practice’s on the track - Thursday and Friday organized by the Association Pro-Kart and they will take place from. 11:00 to 20:00. It should be noted that the registration of participants, the technical commission on Saturday, will take place from. 8:00 to 8:30, in parallel from 8:00 to 9:00 will take place in the technical control (to classes). 9:00 will begin free training rides for all classes. The Shareholders' Meeting will take place at 8:30. We remind you that participation in the meeting is invariably obligatory and please not to interfere! The total estimated duration of the competition 06.11.2016. It is from. 8:00 to 18:00. It is also stressed that participation in the formal awards ceremony is mandatory, not taking into account places won and prizes! In view of the hot weather, the weather forecasters promises us, we invite you to take care of protection against the sun's harmful rays to cover itself with special sunscreens, be sure to use the head of the helmet, as well as to accommodate more water. We remind you that all the race results online will be found here www.results.lv , In turn, the race will be published www.prokart.lv page under the "Race". As well as throughout the event, participants views and behind the scenes will be possible to follow up on our Facebook page www.facebook.com/Pro-Kart . We remind you that the results of the background, photos and video of the season 06/11/2016 3rd stage are possible to find in the www.prokart.lv page in "Race / 2016"
For successful preparation process and meet on saturday on the track! Очень радостная новость! В Кандаве всегда какое то особое настроение... даже не могу примонить когда бы там было ветренно, холодно или зябко, это всегда самый настоящий праздник картинга! Если вспоминанать прошедние соревнования то она кажеться вечно солнечной... радость громко бегающих, играющих гонщиков младших класов после заездов и да конечно басейн с вышкой который спасает в жару, уборочная машина подметающая кромки трассы... а сколько было там фантастических дуелей... идилия нашего с вами спорта! Друзья и соперники - до встречи на трассе!